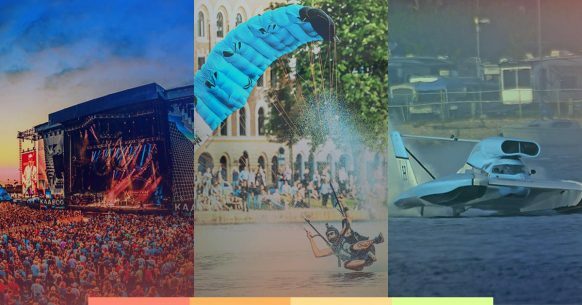 San Diego is the place to be this September 14-16, hosting world-class events and awesome celebrations. There’s something for everyone, so find your adventure and be a part of the buzz. KAABOO is the ultimate live entertainment experience. Enjoy world-class music, hilarious comedy, inspiring contemporary art, incredible cuisine, craft libations, and personal indulgences. This year’s lineup includes today’s hitmakers to bucket-list acts and everything in between. See Foo Fighters, Imagine Dragons, Katy Perry, Robert Plant & The Sensational Space Shifters, Halsey, Post Malone and many more! Also, see comedic favorites like Craig Ferguson, Iliza Shlesinger, Judd Apatow & Friends, Craig Robinson and many more. KAABOO has partnered with the San Diego Tourism Authority (SDTA) to give you the best deals on hotels in the area, making it easier than ever for you to join in the fun. Swoop Freestyle is the latest extreme sport and the only parachuting event to take place within major cities worldwide, bringing the action straight to people’s doorstep. Swoop Freestyle FAI World Championships 2018 marks the second year of the innovative and multi award winning international sports format. This year’s series will culminate with a final stop in San Diego, where the World Champion will be crowned. Join us, as 18 of the world’s elite in the sport will be showcasing highly demanding freestyle moves, pushing boundaries for an ultimate test of their skills. San Diego Bayfair’s World Series of Powerboat Racing – a family festival tradition for more than 40 years speeds to the finish line. Bayfair has grown from just a hydroplane race in 1964 to an event that featured drag boats, international competitors, live music and aerial demonstrations. Boat-racing tours including Formula One tunnel boats, Grand Prix West, P1 USA, Pacific Offshore Powerboat Racing Association and various semi-professional classes have competed at Bayfair. This entry was posted in San Diego Events and tagged county, entertainment by Brent Bernasconi. Bookmark the permalink.